This product is used to relieve symptoms of extra gas caused by air swallowing or certain foods/infant formulas. Simethicone helps break up gas bubbles in the gut. Shake the container well before each use. Give this product by mouth as needed, usually after meals and at bedtime, or as directed by the doctor. Follow all directions on the product package. If you are uncertain about any of the information, consult the doctor or pharmacist. Fill the dropper to the correct dosage and squeeze the liquid slowly into the baby's mouth, towards the inner cheek. You can also measure the correct dosage with the dropper and mix it in 1 ounce of cool water, infant formula, or juice. Mix well and give the solution to your baby. The proper dosage is based on your child's age and weight. If you are treating the child yourself (without direction from a doctor), do not use more than 12 doses of simethicone per day. Clean the dropper well after each use and close the bottle tightly. If your child's condition persists or worsens, or if you think there may be a serious medical problem, seek immediate medical attention. What conditions does INFANTS' Gas Relief treat? There are no reports of any side effects due to this medication. However, tell the doctor if your child experiences any unpleasant effects while taking this medication. A very serious allergic reaction to this product is rare. However, seek immediate medical attention if you notice any of the following symptoms of a serious allergic reaction: rash, itching/swelling (especially of the face/tongue/throat), severe dizziness, trouble breathing. Before giving simethicone, tell your doctor or pharmacist if your child is allergic to it; or if your child has any other allergies. This product may contain inactive ingredients, which can cause allergic reactions or other problems. Talk to your pharmacist for more details. What should I know regarding pregnancy, nursing and administering INFANTS' Gas Relief to children or the elderly? If you are giving this product under your doctor's direction, your doctor or pharmacist may already be aware of possible drug interactions and may be monitoring for them. Do not start, stop, or change the dosage of any medicine before checking with your doctor or pharmacist first. Tell your doctor of any prescription or nonprescription medication your child may use, including any antacids or digestive medications since some combination products may also contain simethicone. 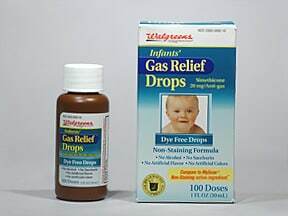 Does INFANTS' Gas Relief interact with other medications? If your child is taking this product on a regular schedule and misses a dose, give it as soon as you remember. If it is near the time of the next dose, skip the missed dose and resume the usual dosing schedule. Do not double the dose to catch up. Store at room temperature between 59-86 degrees F (15-30 degrees C) away from moisture, heat, and light. Do not freeze. Do not store in the bathroom. Refer to storage information printed on the package. If you have any questions about storage, ask your pharmacist. Keep all medicines away from children and pets. 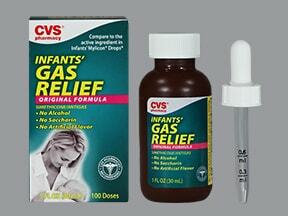 Have you ever purchased INFANTS' Gas Relief?